SFpark has released new comprehensive stats collected during its two-year pilot program phase, documenting the numerous benefits that it garnered by pricing parking according to demand. SFpark is being watched closely by cities around the world, since it’s the first program to thoroughly test demand-based parking pricing principles first professed by UCLA’s Donald Shoup. But the SFMTA hasn’t yet adopted one of Shoup’s key recommended strategies: Giving some of the revenue to local community benefit districts to help win support for parking meters. 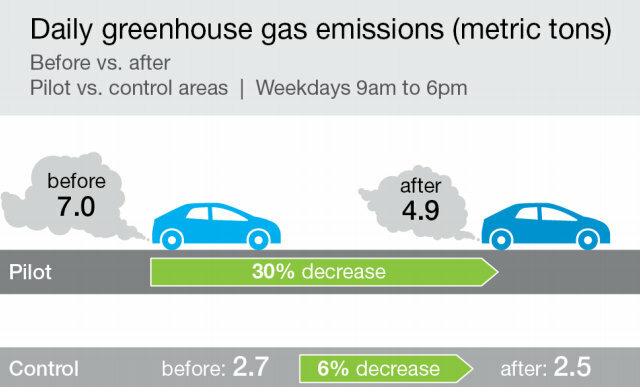 Vehicle miles traveled, and greenhouse gas emissions from cars circling for parking, decreased by 30 percent. SFpark has been widely lauded wherever it has replaced existing, flat-rate parking meters, but it’s a different story when it comes to expanding parking meters to new areas. Due to fierce neighborhood resistance, the agency abandoned its plans to install SFpark meters in Potrero Hill and Dogpatch, and watered down and delayed its plans in the northeast Mission. In each of these areas, street parking is mostly free and nearly saturated, with drivers circling for an average of 27 minutes during weekdays in the northeast Mission. The SFMTA could certainly use all the help it can get in making parking meter expansions more palatable, given the political failure thus far of the SFMTA’s attempts to expand its meter program without offering a revenue split to neighborhoods. The Board of Supervisors, catering to the free parking crowd, even gutted the SFMTA’s ability to install new meters during its next five-year meter contract, and Mayor Ed Lee used his leverage over the SFMTA Board to undo Sunday parking metering. It seems that there may always be a vocal minority who relentlessly clings to free parking, no matter how much data they’re presented with that demonstrates SFpark’s benefits. Unfortunately, they’ve recently been winning the fight against smarter parking management. If there’s any way to convince the opposition, it may be to hand over some of the revenue to Community Benefit Districts, which would yield more immediate, tangible results. Abstract citywide benefits like reduced traffic and pollution, or increased turnover for businesses, can usually be demonstrated only with numbers reported by a government agency, which doesn’t seem to resonate well with those who can only remember digging for quarters at a meter. That familiar refrain was echoed at the SFMTA’s press briefing yesterday by KCBS reporter Barbara Taylor. She took several minutes to elaborate upon her perception that parking is still hard in SFpark areas, and that she’s seen the SFMTA remove parking spaces for construction or for improvements like bike lanes. She said that she never sees meters that cost 25 cents per hour, and repeatedly asked where they are. The 25 cent rate that Taylor sought out is the lowest rate SFpark meters run at, in locations (viewable on the SFpark website) and at times with low parking demand. According to SFpark manager Jay Primus, 17 percent of the program’s meter hours run at that rate, whereas the top-end $6 per hour rate only applies during 1 percent of SFpark meter hours. Fortunately, Taylor didn’t let her anecdotal parking experiences didn’t keep her from filing an accurate report on SFpark’s news. All in all, there’s something for everyone to love in SFpark’s report. 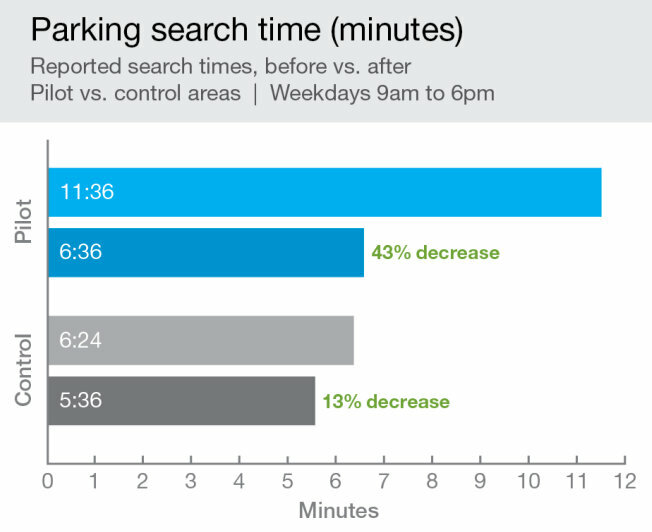 On average, motorists save five minutes every time they look for a parking space and, on average, pay 4 percent less. 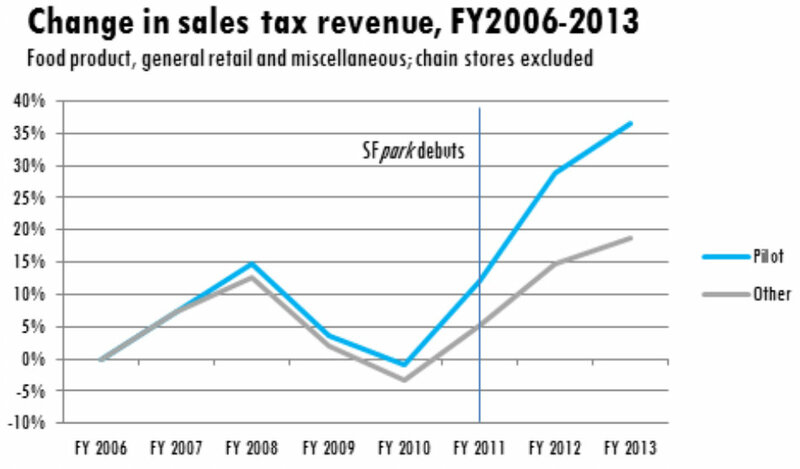 Sales tax revenues in SFPark commercial districts went up by more than in non-SFpark areas, although the report stops short of “confirming a causal relationship” between increased parking availability and increased business. “It stands to reason, we think, that making it easier to park will only support economic vitality,” said Primus. 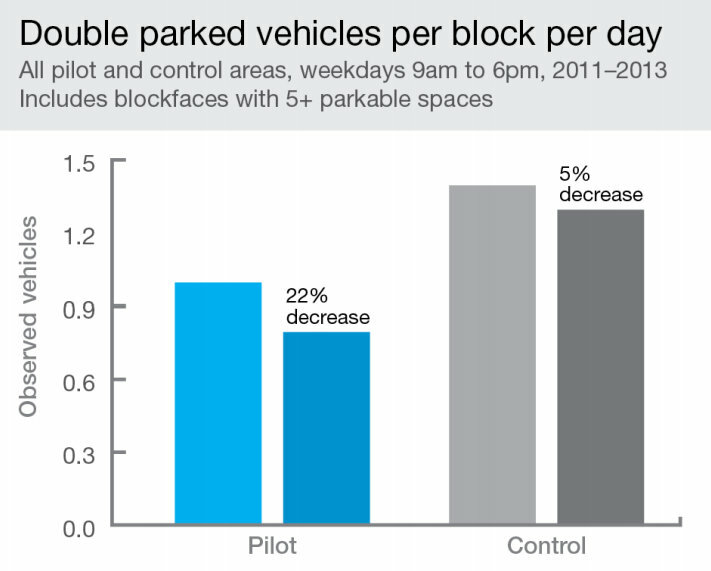 Double parking decreased by 22 percent in SFpark pilot areas, compared to a 5 percent drop in control areas. 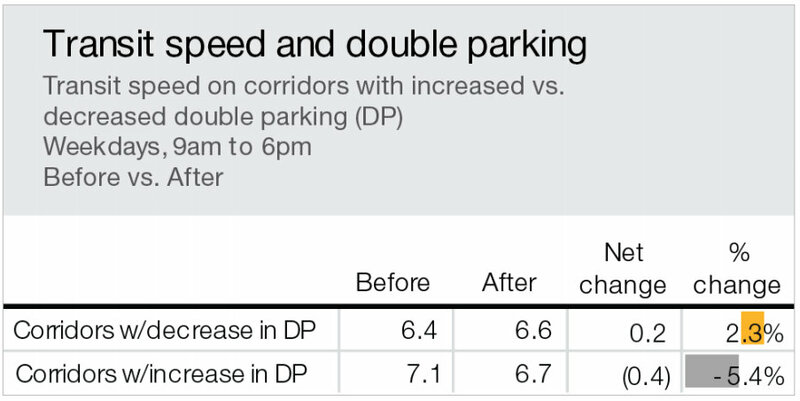 In areas that saw double parking decrease, Muni speeds increased by an average of 2.3 percent, and Primus noted that bike lanes were also made safer. The SFMTA expects to propose a plan for SFpark’s expanded operation in the fall. For now, the SFpark phone app and in-ground parking sensors have been turned off, though the agency still monitors parking occupancy through meter payments. The agency is also upgrading old flat-rate meters to digital ones that accept credit cards, though they don’t have variable pricing. Reiskin said the SFMTA is thinking carefully about how to communicate SFpark’s benefits effectively. Awesome! I really hope to see a more direct link between revenues and improvements in neighborhoods. I hope it’s not just beautification. 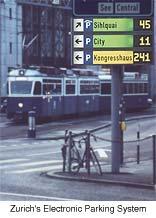 There should be more transit service and bike lanes to neighborhoods that bring in revenue. But unfortunately, this won’t work if neighborhoods are against installing new meters, or raising the price cap. SFPark hasn’t really increased net revenue, and simply diverting it to neighborhoods will mean that the general network falls further behind. One reason I’m very disappointed (one might say “enraged”) about the repeal of Sunday meters is there are places on Valencia where it really hasn’t been tested yet. The logic is a little weird, but Valencia started the program priced at $2.00 an hour–a residential rate–while many places started higher. After 12 rate adjustments there are several blocks of Valencia which are priced at $5.00 after noon. The math says these blocks have never missed a rate increase, and they still tend to be over full on weekends (and evenings). SFPark hasn’t run long enough for these blocks to be priced properly. Maybe, just maybe with $6.00 an hour parking on Sunday, there would be enough legal parking spaces so all the church goers wouldn’t need to break the law. And if we had evening meters, people might not drive to the bars. One can only hope for the future. Not surprised about the findings it looked good from the start. I knew it was going to be beneficial NO MATTER WHAT!!!!!! I would totally love to see this implemented across the board in all existing and current meterized parking spots in San Francisco. The one thing that wasn’t included, and that I think would make this even more successful than it already is proving to be, is large, lighted signs that show the cost of parking on a particular block. When you’re driving, looking up pricing on the app is not convenient nor is it a good idea, and many people driving into town don’t even have the app. The revenue should go to the property owner adjacent to the meter, not some CBD. People wouln’t oppose the meters if they received a revenue stream as part of the deal. Heh. That would allow the property owner adjacent to the meter to park in “his” spot for free all day, because he gets all the meter fees. Nice deal! Note that it’s the price that’s important, not so much the technology. No need to waste millions on sensors for every spot (in this case, funded by the federal government). If we can get more buy in for meter expansion through returning some of the money to CBDs, then you can potentially negate some of that loss with increased overall revenue. If CBDs still do not allow for more buy in then you’re right, it would be a loss for the agency overall. The problem with this is it presupposes that road space is the property of the adjacent homeowner, which is emphatically not the case. It’s public property, and the revenues collected from charging for its use should be spent on things that benefit the public. But if the property owner received a stream of income from the meter (not all the income, but some) they would be incentivized to support the program and not oppose it. Greed for the public good! That is good for the property owner, but bad for everyone else. Right now, the income stream goes to everyone (in the form of whatever SFMTA does with it). You are proposing that it goes into one person’s pocket. So we get the unfettered support from one person and non-support from everyone else. Or are you saying that the minority who own properties fronting parking meters are more important than everyone else? The City takes so much in the way of taxes and fees, why not give some back to the people who would be otherwise inconvenienced? It would generate goodwill for the program and turn opponents into advocates. Or you can have people fight the program and resist the meters. These stats just solidify the fact that people are so frustrated, they’re shopping online, not locally. I wonder if a ‘study’ has been done about the loss of revenue to City merchants? For example, Flax recently told me they’re leaving their location partially due to loss of income that has never recovered since the 2008 crash. Once ALL parking was confiscated along Market, my friend’s business at Octavia Lounge dried up and he went out of business. Right, let’s just KILL all local mom-and-pop businesses. I shop in Burlingame, it’s 25-cents and hour, for the same stores. 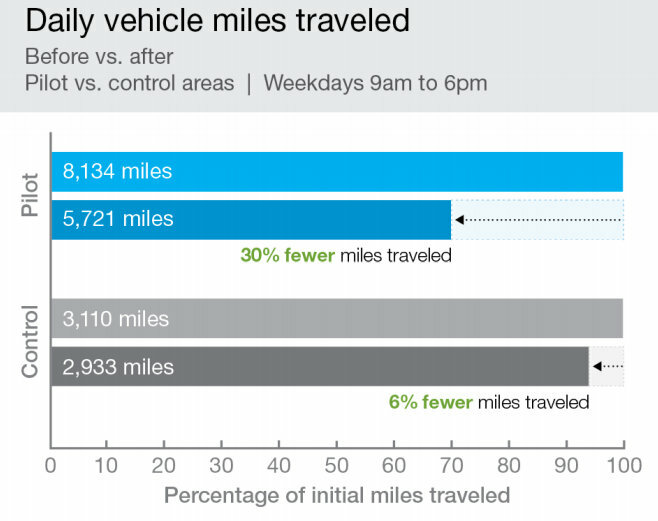 It takes less time to drive there than to take Muni across town. Maybe, just MAYBE, I won’t ever bother going over there. At all. If I’m punished for doing so. Not everyone has time to sit for an hour on Muni (if it’s not a Sick Out) or can wear spandex to ride a bike to work. At 9th Ave and Irving, the SFMTA’s own study showed that drivers to the neighborhood spent FIVE TIMES the amount of money than Muni riders. So their answer was to eliminate parking along most of the corridor. Those drivers aren’t coming back; pity the poor merchants. This would never happen in most neighborhoods in SF. I don’t see this happening even if the numbers were for metered spaces rather than a garage. Remember when MTA had started construction on two signs for Oak and Fell, residents demanded that construction stop immediately and the signage infrastructure be taken out. The signs were already approved and had gone through the regular approvals/appeals process. How do you suggest SFPark continue to gather data? Having actual people do this on foot is impractical these days. MTA use to do this prior to SFPark, and rates were assessed and changed once every several years. In the next phase, perhaps MTA can procure sensors with a longer battery life, or find sensors that can be integrated into the parking meters and draw power from the meter. Very long overdue. This could have been a good spot and restaurant but it just didn’t have it. I have been both for brunch and dinner and both are equally as terrible. The bad sign on the awning alone was enough to scare you away! I am willing to wager a full 25 cents that you can’t produce a single bit of data that shows people are shopping online because they cannot find parking. Plus, who the hell shops for Sunday Brunch online? I have reason to believe the general aesthetics of _anything_ the MTA designs is cause for protest. But if the sign were as typographically pleasing and as well built as the example above, there probably wouldn’t be much opposition, especially on major thoroughfares. Meters make it easier to find parking, so evening meters might make it easier to drive to the bars. Having to pay a market rate for a resource in scarce supply (in this case, parking) when multiple alternatives exist (walking, taxis, Uber, etc – in addition to BART, Muni, & spandex) is punishment? The beauty of the windshield perspective. Of course, it’s okay for our urban and global environment to be punished at little cost to the polluter if it’s for the convenience of the motorist. I understand the political motivation, but the actual proposal does a lot of good that does effectively put money in the pockets of owners (by improving the land around their property), but this way it actually provides benefits to the broader community, not just the local owners’ bank accounts. Actually, that suggests that it could even work in residential neighborhoods! The meters report payment data, which can be used to estimate occupancy. Not 100% accurate, but the sensors aren’t either. Sensors are at least an additional $200 per spot per month and that is being very generous. If necessary, you can temporarily install video cameras on a particular block to report occupancy. What he means is that this KCBS reporter felt the need to direct her own ‘personal observations’ at Jay Primus during the SFPark press briefing despite, you know, this not actually having any statistical relevance. I especially loved the bit where she says she shouldn’t need to get on the website to find the location of 25-cent meters. Gee um…I guess we should go back to the days of info-by-phone and forget this whole internet thing because, what? That’s right. Gap. Apple. Banana Republic. all the mom and pop of burlingame. Just remember, everyone, any of you who still aren’t quite on board with congestion pricing–as much as I’d like to think rlrcoaster’s a random crank who has no ability to think economically, I suspect a hell of a lot of city traffic is directly attributed to foolish decisions we make to fuel American-style consumerism in addition to the choices we make about housing and jobs. So sure, rlrcoaster, go ahead and keep driving to Burlingame. At least you’re not trying to drive downtown. But others like this guy aren’t as price-sensitive–so hopefully soon our regional governments will realize we have no choice but to start congestion pricing. And maybe charging for 101 access while we’re at it…. The reason for raising rates id=s to exclude those who won’t.can’t pay the rate. For lower income people this means they’re paying for this infrastructure but can’t use it. Making the poor subsidize the wealthy is draconian, at best. As if the division of classes and abuse by the wealthy weren’t bad enough, this program exacerbates the social dilemma and should be outlawed.